New frame update coming soon! 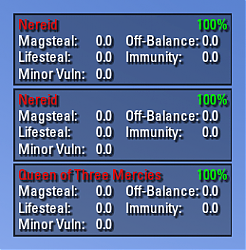 RaidBuffs is designed for tracking important debuffs for organized trial runs, regardless of who applied the debuff. It tracks the state of debuffs on bosses in real time, giving visual feedback if a debuff is active, and how much time is remaining on it. 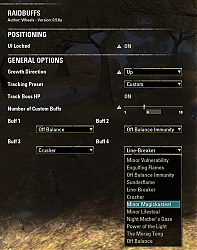 This addon will work on any mob that has a boss aura in the game, and will track up to 10 debuffs on up to 6 bosses at once (the current max number of bosses in ESO). 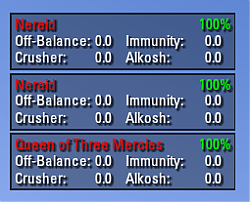 In version 0.6.5a, RaidBuffs, RaidBuffsHealer, and RaidBuffsTank have been consolidated into one convenient addon. Each addon has been giving it's own preset you can select in the new GUI menu. 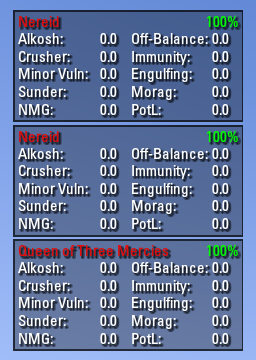 In addition, another preset has been added for Dps, tracking more Dps oriented debuffs. 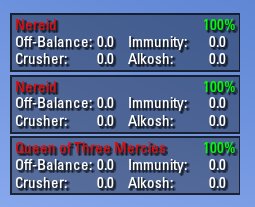 The ability to have the health of each boss displayed has also been added, along with a setting for which direction the boss frames grow in (up vs down). RaidBuffsHealer and RaidBuffsTank are no longer being developed, so it is highly recommended that this addon is used instead, as there have been significant tracking improvements made. WARNING: This feature is still being developed and likely has some bugs. If one is encountered, please leave a comment describing it and the circumstances under which it occurred. Also added in version 0.6.5a is the ability to setup a custom tracking profile. Again, up to 10 debuffs can be tracked for up to 6 bosses, and you can select which debuffs you want tracked, as well as their position in the boss frame. Huge thank you to Dolgubon and other addon devs who helped sort out improving RaidBuffs. Started framework for some really cool features to come! 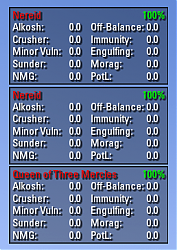 Added additional IDs for Off-Balance. This should now be timed more consistently. Hey thanks for the amazing addon! Any chance you can improve scaling so that the window doesn't get all blurry? Thanks! Linebreaker is the actual debuff name for alkosh yes, and I'll look into a centered alignment option. 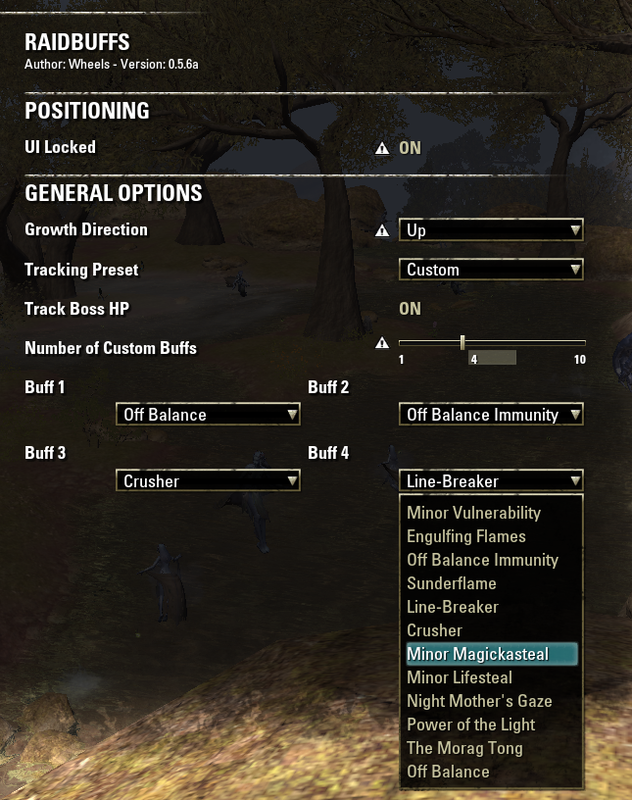 I know the addon tracks Alkosh from the description and from screenshots / videos of it in action, but I don't see that as an option under custom buff selection.... unless Line-Breaker is Alkosh? As for the request, I would love if the growth direction could expand out from wherever the main frame is located. I know I can position it up and have it grow down or position it lower and let it grow up. However, I find that having it just off-center is good for me when there is only one target. Unfortunately, this means that whichever growth direction I select, it ends up padding well off of center for most of the frames in fights with several boss frames. Would love for it to basically count the starting frame as the middle and expand outward up and down. Thanks again for the addon. It's glorious! I've been considering a profile setup as well, I'll look into making one in a future update. Thank you! First, you can avoid the whole NA-vs-EU hassle by storing the data using the character ID instead of character name (see GetCurrentCharacterId()). 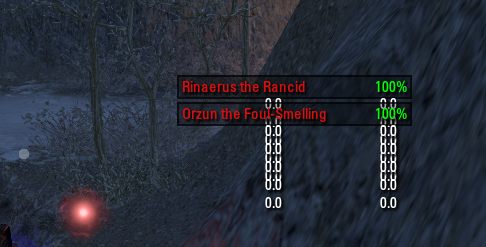 It's virtually impossible that someone would have two characters with the same ID on EU and NA. And it would mean that the settings will persist through character name changes. But as someone with four tanks across two different accounts, across two different servers, it's somewhat cumbersome to have to configure the addon each time for each character, particularly after a settings wipe like this. Why would I want one tank's display to be different than that of another tank? I generally want the same settings across all characters, across all accounts, across all servers. So what I would suggest is something where you have different profiles. E.g., a "DK Tank" profile. The player will customize the buffs (either using the Tank preset buff list or a custom buff list), the position, etc. for that profile, and then every character--regardless of account or server--that uses that profile will share the same settings, and if I move the panel on one character that uses the "DK Tank" profile, it will affect every other character that also uses that profile. Thanks, yes you're right. 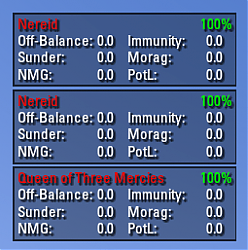 When I was checking RaidBuffs addon settings again I've found that my custom preset was gone. So, I've made customizations again and then it worked. I don't know aswell what is causing this but it happened on my some chars randomly, I had to make custom presets more than 1 time. But at the moment there isn't any problem and thanks for efficient minimal addon. Last edited by Gallaigh : 10/26/18 at 06:45 AM. Usually the frames appear like this if you select the custom preset and don't select any buffs to display. If I could get some more information on how you got this to happen that'd be helpful, as I'm unable to reproduce it myself. Which buffs did you have selected? I used Custom Panel, what's the cause of this? Typical most important things for a usual tank. I've added a debug function which dumps me your buffs table a bit to chat. First output block of "Debuf master names" is not sorted as in pairs() will not sort the abilityIds! Not sure how to output the ability ids properly there. Last edited by Baertram : 10/07/18 at 09:07 AM. Still getting this error message as I approach any of the world bosses in any zone (not checked all but at least Captain bones in Shadowfen had it happen just today). Savedvars (as shown on gitter). Last edited by Baertram : 10/07/18 at 08:37 AM. Weakening should already be an option available.